Hopefully, I am in the home stretch of my busy period. I have a couple of big projects culminating with a meeting on the 21st. After that, things should slow down. The operative word there is "should". In the mean time, here is todays Thursday Thirteen. 2. This a limited production of a print illustrating the diversity of the state of Kentucky. All the people are assembled in the shape of the state . . . er uh commonwealth. 3. This is a couple of old photos illustrating the African-American tradition in these parts. The photo on the left is an early 20th Century military unit. The photo on right shows an all black school from the 50's. 4. This giraffe was a Christmas gift. I collect giraffes somehow. 5. These items are found on my desk top. It represents my loyalty to my alma mater, my spiritual side, and the desire to have a sanitary mouth. 6. My chair. Well, it is in my office! 7. These are a couple of proclaimations recognizing our service to the city. 8. This is the famous ball that my wife sent me. 9. What would an office be without a bulletin board? 10. Now we are getting the actual picture of what is going on here. These are boxed up documents and files. I boxed them three years ago because they were supposed to replace my carpeting. From time to time I have dig through these boxes to get something I need while I am waiting. 11. This is the carpeting that they are supposed to replace. I am sure it was stylish when those who worked here trapsed across it in their leisure suits. 12. My coffee mug. It will be lonely for a while because I am only drinking water for the foreseeable future. I have to jump start myself out of this weight loss plateau I have found myself in. 13. Last and probably least is my bookshelf. It is stuffed full of law manuals and folders. However, its most important function is to be the home for my giraffe and fake flowers. I officially have a boring office. I guess I could have shown my 10-year old poinsettia or the plant I got when my grandmother died, but I only had thirteen to work with. My wife is turning into a Libertarian. It started with the issue of mandatory vaccinations against the HPV. She thinks it shouldn't be mandated. I don't really have a dog in the fight, but I can see both sides of it. As it turns out, she also doesn't think drugs (even the most extreme ones) should be illegal. She feels the government doesn't have a right to infringe on individual choices. Everyone has to be in a "camp". No one, including my wife, seems to decide on political stances on an issue by issue basis. As for me, I don't believe requiring a person to wear seat belts by law is right, but I certainly think that crystal meth should be illegal. Have you noticed that gas prices can rise 20 to 30 cents in an hour, but takes a couple of weeks to drop that much? What a scam. People eat out too much. My wife needs to find a way to make money at home. Her work life stresses us both out. She started selling things on Ebay, but I doubt she can make a living at it. I have been thinking about posting a serial on this blog. I want to take my writing discipline to the next level. Don't worry, if I do, I will have a warning at the top of the page so those that don't want to deal with that can leave quickly. Spammers are insane about offering people lower mortgages. That and male enhancement are the most spammed thing on the Internet in my experience. I guess some may take a chance on male enhancement on the Internet if they think they need it, but who answers a mortgage spam? That is kind of important to just take a chance on someone that uses that kind of disrespected marketing, don't you think? There are too many commercials on talk radio. Most of the stuff I hear on it, I disagree with. I wonder why I listen. I guess I like irritation. I actually have made two attempts at this today. The first one was thirteen things that I have in my office (and why). I needed my camera for that and the battery was dead. 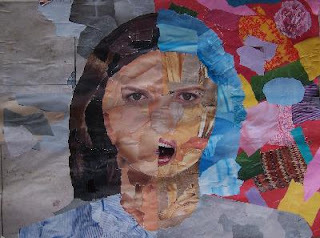 Then, I decided I would do thirteen things I have learned about relationships drawn from the ones I have experienced. It took me over an hour to come up with this post. When I went to publish, I got an error message. I went backpage and found a blank sheet. I used to do my posts on a separate program and copy and paste it on this page, but I got lazy. Blogger led me down the merry path and I got away without doing that for a while. But today, my laziness bit me in the behind. Truthfully, I was so furious when this happened that the thought of EVER doing another Thursday Thirteen made me sick. I got over it, though. It gets easily blocked by my firewall. Everyone here thinks they are a writer. I am part of everyone. It sold out to the giant "Google". It makes me feel obligated to post multiple times a week. I want it to make me feel that way. It promotes a social hierarchy. Those bloody word verification sections of the feedback pages! Every once in a while, I have a post on Wednesdays called the "Wednesday's Whys". No this is not some meme floating around blogland (that I am aware of); it is something I made up and did one time before. Things get into my head and I can't find a GOOD reason for it so I simply ask "why". A lot, but not all of todays questions have to do with driving. 1. Why do people insist on going slow in the right lane on the highway? Is it that they don't know it is wrong, or do they simply not care? 2. Why is that people from rural counties do not enter into the intersection to turn left when the light turns green? They sit back like it is still red till the opposing traffic clears to turn and then everyone behind them has to wait for the next light? Are these the same people that cruise slowly in the left lane? 3. Why do some people (maybe the same ones mentioned above) stop TWICE at a 4-way stop? If they have to stop twice, they stopped in the wrong place the first time! 4. Why, if the Bush Administration claims the right move is to send 20,000 more troops to Iraq, is their best wartime buddy Great Britain calling their troops home? I mean, if the British troops are no longer needed where they are, move them where they are needed. 5. While I am on the war in Iraq, why is it that if one thinks the war has gone on long enough, he is accused of not supporting the troops? I can't think of anything MORE supportive than wanting them to keep out of harm's way. 6. Why is it that Chief Illiniwek (the University of Illinois' mascot) has to die? Tonight is the last time the Chief will appear at a U of I game because the school has finally bent from the pressure they are getting from the NCAA. I get it that 'some' mascots are offensive to certain groups. The stupid-looking cartoon indian that makes up the logo of the Cleveland Indians' baseball team could be offensive to some native-Americans. However, the Chief is not a mocking caricature. It is probably the most revered of all "mascots" that I have ever seen. The person playing the chief takes it seriously and is very much respected during his time in the spotlight. On top of that, the Illini indian tribe has been extinct for many years (hundreds of years I think), so who is it that is offended? I wonder WHY no one from Dublin is all up in arms over the Notre Dame Fighting Irish? I think it is because they are proud of it. I am all for avoiding things that people find offensive, but this pc-craze is getting pretty tired. From time to time, some things are obviously offensive and they need to change. However, let those that are offended say so. I don't need a white, slick-haired nerd in a suit to be the pc police and dictate what we can and cannot say or do. I am offended by the extreme insistence that terms and traditions have to change, but evidently no one cares about offending me. Maybe it is because I am not extinct. One day I, and those of my ilk, will be. We are due, aren't we? It is time for another episode of "As the Stomach Turns", aka "How is married life treatin' ya?" The writers of this episode have been and is continuing to pound the same theme, which is that the wife cannot stand prosperity. Sunday was a great day for us. We went to church, went out for lunch, watched a movie and felt extremely loving and close to each other. Monday morning rolls around and she things are still very sweet. THIS, is marrital prosperity, my friends. Then, it happened. I am sitting at work starting my work week when I get a call from the spouse (she always calls me when she is on her way to work). Right off the bat, she brings up a controversial topic. WHY?!?!?! This topic is, of course - for those of you keeping score at home, is my snoring. She starts the conversation by asking this question, "Are you going to go the doctor about your snoring?" Not a good topic, not a good way to introduce it. First of all, I hate to go to the doctor. Yeah, yeah, I know what you are thinking, blah blah blah. Whether or not I SHOULD hate to go to the doctor is beside the point. The point is that I do and she knows it. Secondly, it is a mistake - I don't care how you slice it, to bring up a controversial topic when a) one or both partners is at work - especially on a Monday morning; and b) bringing up a controversial subject right in the height of marrital bliss. To violate these principles of common sense is just sheer idiocy. Even so, she still might have been able to get away with it if she would have approached it differently. She could have said, "Sweetheart, I love feeling close to you and I hate it when we can't sleep in the same bed for me to be able to sleep. Do you think we can work on this problem again?" But no, it is, "Are YOU going to go to the doctor," which I read, "Are YOU going to do something like wear uncomfortable headgear, or better yet, go under the knife so I can sleep and still keep tabs on you during the night?" I have to tell you; I got grumpy immediately. We haven't been to keen on each other since. I am willing to apologize for perhaps overreacting (I didn't yell or cuss or anything, however), but track record has already proven that this topic in this fashion is on a collision course with disaster. Stay tuned and you will hear the husband say, "I still think you gave up too quickly on those ear plugs." This week, I thought I would revisit all (or at least 13) of the crushes I had on celebrities while growing up. These kind of crushes are the best because there is no danger. You will NEVER get rejected because your crush will never have the opportunity. I remember thinking that these girls WOULD love me if they just had the chance to get to know me. Because of the obvious barriers, I never had to be . . . well . . . crushed. 1. 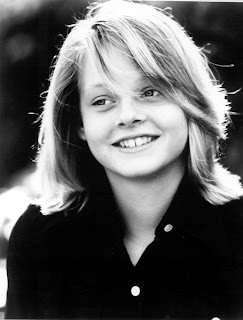 Jodie Foster - before she was raped in "The Accused" or feared Hannibal Lecter in "The Silence of the Lambs", Jodie Foster melted my heart in such Walt Disney productions as "Candleshoe" and "Freaky Friday." 2. Kim Richards - of the "Witch Mountain" movies. Can you tell I watched a lot of Disney movies as a kid? 3. Patty Duke - I had crushes in all eras. Thanks to the magic of syndication, age was not a factor. If you were hot and young in the show - even if it was black and white, I loved you! I watched the Patty Duke show religiously on cable. 4. Olivia Newton John - "Grease" was the word and I wanted to get "Physical" (I didn't mean for that to sound as dirty as it did - but I am not editing it, either). 5. Kristy McNichol - Kristy played "Buddy" on this show called "Family". Despite her character's name, I watched. 6. Susanna Hoffs - lead singer from "The Bangles". Her eyes were mesmerizing. 7. Danika McKeller - Winnie Cooper from "The Wonder Years". 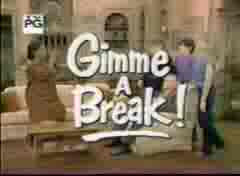 Why won't they put THAT show on TV Land? 8. Tiffany - She was Debbie Gibson's biggest rival. I fantacized that they would fight over me. 9. Farrah Fawcett - I first noticed her doing a Noxema commercial. Then there was "the poster"! 10. Justine Bateman - Mallory on "Family Ties" I liked her more during the early years. After that she got weird looking so I went elsewhere. 11. Lisa Bonet from the "Cosby Show". She marched to her own beat and I always wanted to be a drummer. 12. Phoebe Cates from "Fast Times at Ridgemont High". She was a more sultry and glamorus "Winnie Cooper"! 13. 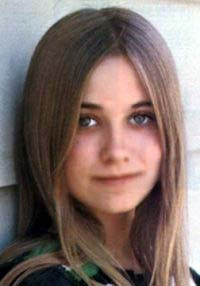 Maureen McCormick from "The Brady Bunch". She was Marcia Brady and I loved, and I mean LOVED everything about her. She was the only Brady kid that could actually sing and she melted my heart with every "Sunshine Day". Marcia, Marcia, Marcia!!! Happy Valentine's Day to everyone. This is not only a special day for lovers, but also one for me and this blog. This is my 100th entry. Most of you are well past that and are probably not impressed. However, it is a milestone for me in my attempt to enhance my discipline in writing. Most of the time on Valentine's day, we hear about romantic dinners, gifts, messages, bed and breakfast trips, etc. I play along. Today I am taking my wife out for a nice linner (meal between lunch and dinner), going to see a romantic comedy ("Music and Lyrics"). We have to do it this way because she has class tonight. I will also be giving her some gifts (three books - one being one of love poetry), a nice card, and a pair of diamond earrings. I am a sap like the rest of the folks who fall for the ingenious marketing ploy known as Valentines Day. Robertson McQuilken was president of Columbia Bible College and Seminary in Columbia, South Carolina. His wife, Muriel, was not only a devoted wife and mother, but also a painter, speaker, hostess for the college, fabulous cook, and host of her own radio program. Then Muriel was diagnosed with Alzheimer's. Initially, the college board arranged for care, but then McQuilken decided to take early retirement to care for his wife. In spite of her deterioration, McQuilken stood by her and continued to love her deeply. Eventually she rarely did more than mumble "nonwords." He wondered if he would ever hear her sweet voice again. Then came February 14, 1995. McQuilken writes: Valentine's Day was always special at our house because that was the day in 1948 that Muriel accepted my marriage proposal. On the eve of Valentine's Day in 1995…I bathed Muriel on her bed, kissed her good night…and whispered a prayer over her, "Dear Jesus, you love sweet Muriel more than I, so please keep my beloved through the night; may she hear the angel choirs…"The next morning while Muriel slowly emerged from sleep, I dipped into memories of some the happy Lover's Days long gone. Finally she popped awake and, as she often did, smiled at me. Then, for the first time in months, she spoke, calling out to me in a voice clear as a crystal chime, "Love… love… love…" I ran to embrace her. "Honey, you really do love me, don't you?" Holding me with her eyes and patting my back, she responded with the only words she could find to express agreement. "I'm nice," she said. Cut it Out? Not Yet! My head is spinning. This is a frantic week for me. I thought I was going to have to my dog, Marley go under the knife again. The growth he had on his hip returned. For some reason, I failed to mention this before, so I will fill you in. When we first got Marley back in late October, he had a growth on his hip. The woman that gave him to us said that the vet didn't think it was a big deal. Not long, he began to mess with it. He would lick and chew till finally it started leaving little doggy fluid tracks all over the place. I took him to the vet where they removed it and told me that it was due to some foreign material that was a result of a puncture wound. They cleaned it out and it healed up okay. I noticed last week that the growth came back and he started messing with it again. I took him to the vet and they recommended that it be cleaned out AGAIN with the additional cost of about $500. This was very troublesome. I didn't really have the money nor did I want Marley to have to go through the ordeal again. I started him on antibiotics Friday. I told the vet of my theory about how they probably didn't get all the foreign matter out last time and it festered up again around the fragment. She didn't like that theory, but was not offering a theory of her own. I told her that I couldn't afford to do the surgery every couple of months. She agreed but offered nothing of any value. Last night, I noticed that the growth was smaller and it was draining. I took him to the vet for the appointed surgery and told them unless there was a compelling reason to do the surgery TODAY, I was going to take Marley home and keep an eye on it. That is just what I did. This has been the first time that I have been flirting at discontentment with this vet. There are four doctors that work there and I seem to get a different one each time I come in. I am not thrilled about that. Now, I am wondering about the competence of some of them and the ethics of others. I don't REALLY think they are incompentant or unethical, but this situation makes me uncomfortable all the way around. I know that medical work isn't guaranteed, but there should be some kind of compassion for the pocketbooks of those that struggle yet give their pets priority. If only I could put Marley on my med plan at work! As life would have it, I have been exposed to a lot of global warming talk lately. News stories, conversations and recently, Al Gore's documentary "An Inconvenient Truth" has made its way into my presence. I really didn't think too much of the global warming stuff before. It wasn't that I denied the problem, I just was too busy to think about it much. Life or God or Al Gore decided lately that I wasn't too busy to think about it afterall. With this backdrop, I discovered Reg Henry's column this week. If you are reader of this blog, you may remember me printing one of his articles in the past ("Interesting Take on Do-gooders"). He has an interesting way of making a point. Do you know what bugs me? The fact that the liberal media always refuse to print the opposite side of controversies due to political bias. Consider the state of our planet. Many scientists have come out with a completely one-sided report that pretends everybody is in agreement with their theory which is based not on science but political motives. The way they tell it, you would think that no controversy exists at all. That is garbage. Brave, knowledgeable voices are raised in dissent but scientific snobs and know-it-alls in the media ignore them. With their superior noses raised in the air, they deny what common sense tells us all every day -- that the world is flat. Have they ever looked up at the moon? It's a great flat dish in the sky. A cow couldn't jump over it if it were a globe -- its width would mean it would straddle the moon and get its udder snagged. The smallest child knows this. Don't tell me that Christopher Columbus proved that the world is round. He just proved that the Italians are wonderful people. It wasn't because it was flat that he didn't fall off the Earth -- America was still on the flat part, that's all. Don't tell me about satellites. The government censors the pictures of the real underside of the Earth, which is all dirt, rocks and roots and looks like the site for a coming Wal-Mart, which, of course, it may be. Only Thomas Friedman of The New York Times dared to speak the truth in his famous book "The World Is Flat." Thank you, Tommy. Even if your America-hating bosses at the Times despise you for your courage, we flat-earthers applaud you! But get this: A bunch of kooks in white jackets recently released another report that said our flat Earth is the subject of "global warming," which, of course, is nonsense because our Earth is not a globe. It may be a little warmer overall on our flat planet but climate change goes in cycles because the weather was invented by the Almighty to give people something to talk about. The report was issued by the Intergovernmental Panel on Climate Change, which is supposed to impress us. Now, if this panel were headquartered in a spot called Bob's Barber Shop and bore its name -- Bob's Hair and Global Emissions Cut -- it might impress us a whole lot more because such gathering places are populated by real people who know a thing or two about life and perhaps even studied chemistry in high school. Instead, we have to defer to "experts." I don't know about you but I hate "experts." I hate them because they know so much and have so much darn expertise. I find that "experts" are better avoided. If a doctor should tell me that I am overweight and should go on a diet and quit drinking, well, I merely tell him to write me a prescription for a cheeseburger and a cold one because what does he know with all his years spent in medical school? It's my body and I know better than any doctor, just as I know better about my planet than any climatologist. Fortunately, the report came out in the middle of our current cold spell, which gave every cartoonist a cartoon about global warming in the deep freeze. How we all laughed! Of course, if the report had come out earlier last month, when it was so warm the buds were coming out, it wouldn't have seemed so hilarious. Fortunately, our nation's talk show hosts have raised their voices on behalf of the people's right not to believe in "experts." Who would any sensible ordinary person believe? A talk show host or a couple of thousand climate change scientists from 113 countries? A talk show host or the best scientific minds in the world? Hmmm. It's a hard one! Why, a talk show host, of course! Just the other day, Rush Limbaugh observed that "there's very little science associated with all this ... it's all politics." It's a shame more of us in the print media haven't told our readers that these scientists are all socialists who want us to eat granola for breakfast and melt down our guns and cars to make giant thermometers. We don't have to look at climate data; we just have to know that pointy heads are saying something that fans our prejudices and gets our knees a-jerking. Hurrah for us! Pass the sunscreen and, if on the coast, the inflatable life vest and let us contemplate this goodly flat frame, the Earth. Now that the Superbowl has been over for a few days, all the weirdoes and malcontents are coming out of the woodwork to complain about something. It is unbelievable. People are even talking about how the commercials weren’t as good this year – like we are entitled to be entertained by corporate America. However, there are two things that really take the cake this year when it comes to complaining. One is complaining about Prince’s performance and supposed phallic symbol silhouette he projected. The other bit of controversy stems from one of the aforementioned commercials. I watched the Prince halftime show. I have always admired Prince’s music although it has been in the past a little bit too risqué for my taste. However, I didn’t notice the silhouette being particularly vulgar. Maybe I just didn’t notice it; I don’t know. However, because I didn’t, I think maybe those who saw it as nasty were looking for it. To me, that makes those people having the problem rather than Prince. As far as the commercial, it was the Snickers commercial with the two redneck mechanic-types finding themselves in a lip-lock while trying to eat the same candy bar. They, being grossed out over their man kiss, start doing manly things like ripping out their chest hair. Gay groups are saying that the commercial and the theme was promoting gay bashing and homophobia. Snickers felt enough pressure from them that they felt the need to pull the commercial from airplay. GIVE ME A BREAK. Since when do these slobby, Larry, the Cable Guy types looked at as role models? If the two men were a couple of lawyers with suits on at a conference table, it wouldn’t have been funny (not that it was to begin with). It is just ridiculous that people have to walk on eggshells just to tell a joke or make truthful observations. I have news for the groups that find this commercial as promoting gay-bashing: The folks that would view these characters in the commercial as role models are already lost causes for you! Let them go! One writer was offended that Colt’s coach Tony Dungy is scheduled to speak at the Indiana Family Institute and that made him anti-gay. I did a little research about this group and discovered that it is a pro-family, Christian group that is affiliated somehow with Focus on the Family. I read the mission statement and it doesn’t say ANYTHING about being an anti-gay group. Sure, being a Christian affiliated group, they aren’t all about the pro-gay platform, but the mission statement is all about strengthening marriages. Read it for yourself. Coach Dungy is a strong, outspoken Christian. Part of being a Christian is to share his faith. If he didn’t, he would be not be true to the convictions of his faith. If Tony Dungy can’t follow his own personal and spiritual convictions just because he is a successful public figure, then we as a society have bigger problems than worrying about commercial contents or musicians’ performances. My wife and I haven't been talking (much) for a couple of days. We say what is necessary, but we don't conversate. I first noticed that there was something wrong with her on Saturday morning. I can't put my finger on it, but she gave off a different vibe. I asked her if there was something wrong - big mistake. My wife gets offended if I ask her if something's wrong. I don't know why. It is the darndest thing. Anyway, that triggered off the silence from her side. On Sunday, when we got home from church, I repeated my mistake but I clarified, "What is wrong - I am only asking you this because you haven't talked to me the past couple of days and that was a giveaway to me that there is something wrong." She responded that she only hasn't talked to me because I "keep asking" her what is wrong - which is a lie. I asked her once. She doesn't like to talk about things. Talking it out is something she detests. That is why I have been silent. I am not an "elephant in the room" type of person. If there is an elephant in the room, not only do I want to talk about it, but I want to get the blamed thing out of there before it crushes the furniture and soils the carpet. This morning as I was taking care of the dogs, she came into the kitchen with a distressed look on her face. I thought she had been dreaming or something. I asked her what was wrong (before I had a chance to think) and she told me that she feels like she is going to throw up and pass out. She thinks it is a side-effect of the medicine she just started taking FRIDAY! She asked me to call her boss and tell her that she wasn't coming in today which I did. I am thinking now that the meds might be the reason that she has been WRONG in this fight. Maybe it is the meds. I hope so; the alternative is certainly no fun to think about. Just a quick note to tell you what is up in my life. WORK - Little by little I am knocking out the stuff at work that is slowing me down. Hopefully, within a few weeks, I can be more attentive to my blog and also start the new one. EVERYTHING ELSE: My health is okay. I am a little more rested. I have dropped a few more pounds so that is always nice - especially since it is so darn cold outside that it is hard to get walks and jogs in. The Colts are World Champions so my home of Indiana is representing. Since my wife and I aren't speaking, things are a little bit peaceful. That is an interesting by-product. MY HOPES - I am hoping that everyone is having a great week and is keeping warm, except those that are in Australia. Since it is summer there, they probably aren't too concerned with keeping warm. I also hope that the rest of my predictions are better than my superbowl one. For those of you keeping score at home, I picked San Diego - of course maybe I meant the 2007 season and not the 2007 Superbowl. Hmm . . . stay tuned.